This generator creates fake titles and descriptions for non-existing work of art. 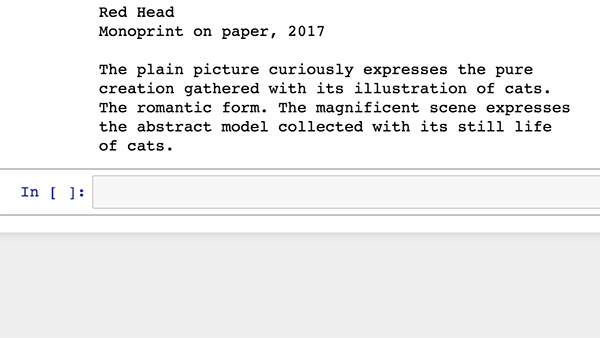 Its built based on Love Letter Generator in the Implementations of early and well-known poetry generators by Allison Parrish. The vocabulary list is based on words that I frequently found in general artwork titles and descriptions. It will be even more interesting if I build the vocabulary list based on actually calculated frequency of using certain words. My least favorite part was repeating words in different sentences despite of its randomness. Its code is not very different from the original Love Letter Generator code I based on, and I think that's what makes it problematic because the repetition of words are rather natural in form of letter, while it's not in formal description.